Bermuda cleans up after Gonzalo Jump to media player Bermudans are clearing up after a direct hit from Hurricane Gonzalo left a trail of damage in its wake on the tiny Atlantic territory. Hurricane Gonzalo hits Bermuda Jump to media player Hurricane Gonzalo has hit Bermuda with winds of about 205km/h (127mph). Bermuda resident describes hurricane Jump to media player Bermuda resident Hartley Watlington describes the arrival of Hurricane Gonzalo. Hurricane Gonzalo nears Bermuda Jump to media player Hurricane Gonzalo is barrelling down on the tiny British island of Bermuda with winds of around 140 miles per hour. 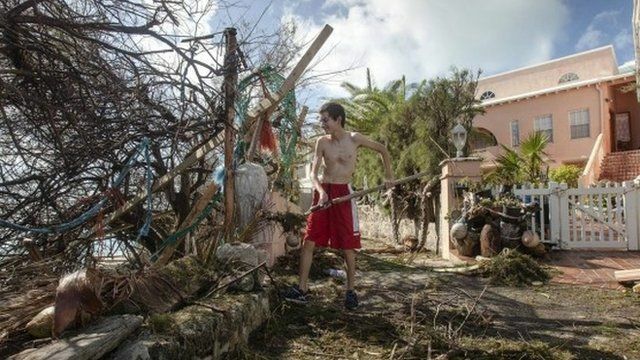 Bermudans are clearing up after a direct hit from Hurricane Gonzalo left a trail of damage in its wake on the tiny Atlantic territory. Bermuda was "bruised" but came out of the storm better than expected, Premier Michael Dunkley said in a radio broadcast. The storm made landfall on Friday, with strong winds and rain causing power cuts for most residents.